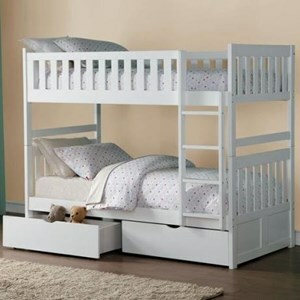 Perfect for kids that share a room or love to host sleepovers, this full over full bunk bed offers sleeping space for two while taking up minimal room space. Clean lines with slats give the bed a classic, relaxed appearance, while the white finish provides a timeless and welcoming look. 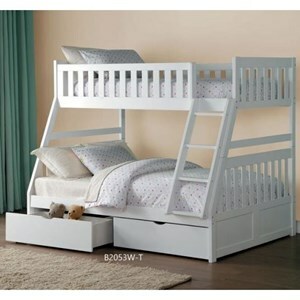 Two full size beds ensure space for kids of any age. Add in the trundle unit and you have the ultimate setup for hosting sleepovers. 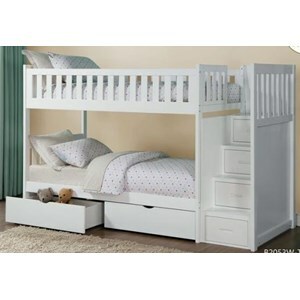 The Galen Full Over Full Bunk Bed with Trundle by Homelegance at Beck's Furniture in the Sacramento, Rancho Cordova, Roseville, California area. Product availability may vary. Contact us for the most current availability on this product. Browse other items in the Galen collection from Beck's Furniture in the Sacramento, Rancho Cordova, Roseville, California area.